eM Client (www.emclient.com) is an email client for Windows. It is free to use for home use, but you will need to get an free license from the developers website. To set up eM Client with Runbox, please follow the step-by-step instructions below. 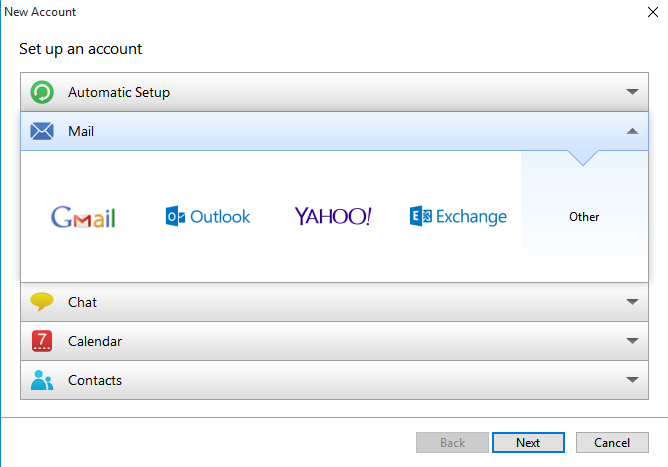 To add a new account go to Tools > Accounts. You will be shown the screen below. We don’t recommend the Automatic Setup as it requires eM Client to automatically detect the server settings, and this often doesn’t work correctly. Click on the Mail option and this will open up. Now choose the Other option on the far right and click Next. 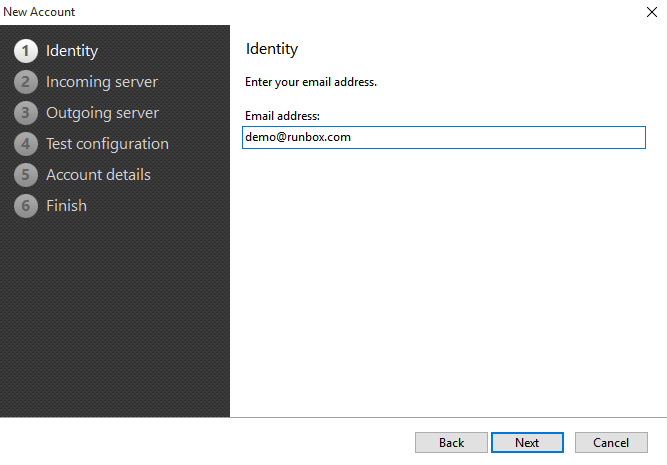 You can find information about the latest server details on our Email Client Settings page and below in the images. 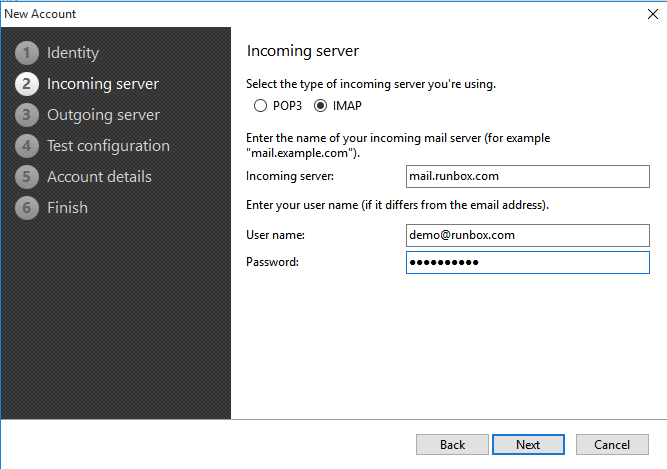 Choose the IMAP option and enter the Incoming server details along with your username and password and click Next. 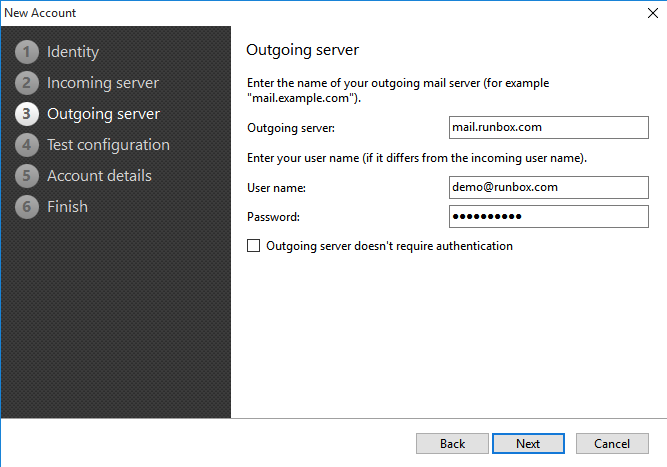 Enter the Outgoing server details along with your Username and Password and click Next. eM Client will now test the connection settings you have entered. You should get the screen below. If the test completed successfully click Next. 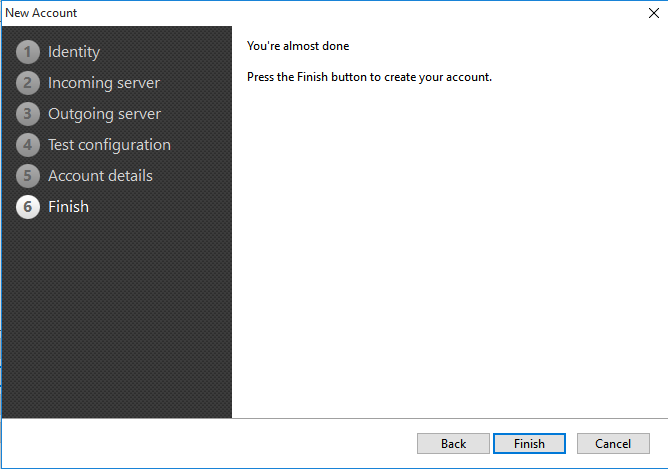 If the configuration fails click Back and correct any errors in the settings. 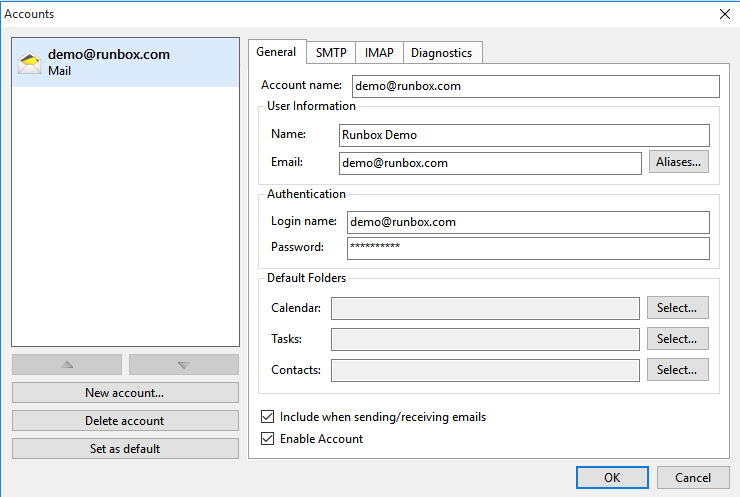 Enter Your name as you want it to appear on outgoing emails, along with a name for your account that will identify it in eM Client. In the image above we just used the email address of the account, but you can call it anything you like. Click Next when you are done. If you are happy with all the details you have entered, you can click Finish. eM Client requires some changes so that it connects securely to Runbox on the correct ports. 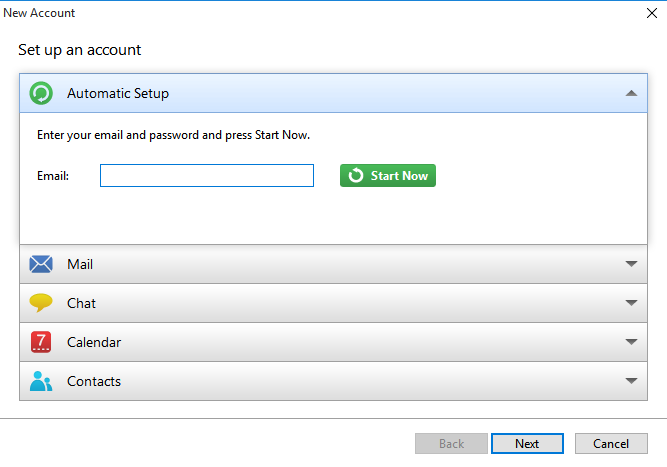 In the main menu go to Tools > Accounts and click on your account in the left pane. 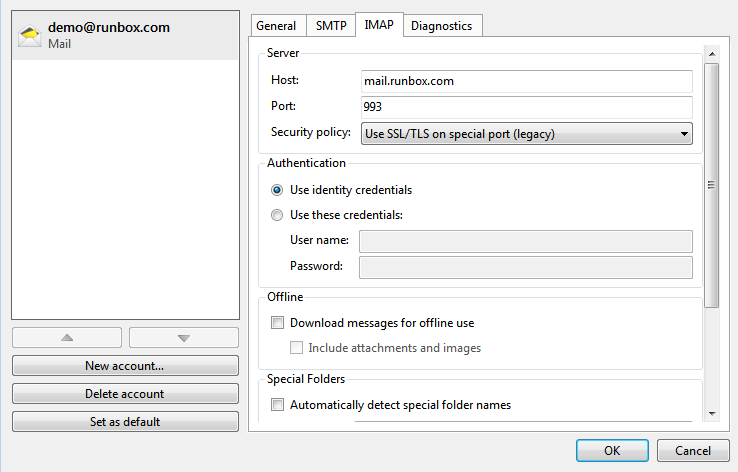 Now click on the SMTP tab. 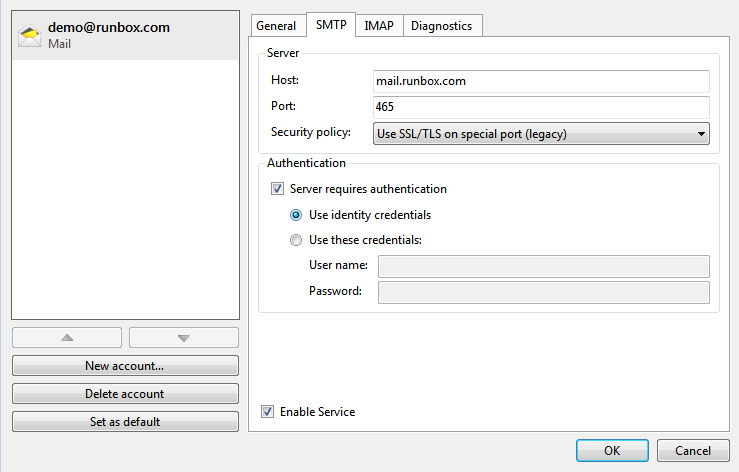 Change the Port setting to 465 if necessary and check that Security policy is set to Use SSL/TLS on special port (legacy). Now click on the IMAP tab. Change the Port setting to 993 if necessary and check that Security policy is set to Use SSL/TLS on special port (legacy). Scroll further down the IMAP tab and you will see the Special Folders section. When you area done click OK.
You have now completed setting up eM Client.